Note: When working on main PCB, always disconnect the plug from the power supply board. The high voltage stored in the smoothing capacitor is easily shorted to the 5 volt line and will destroy the microprocessor. See end of UST-8008 section. DBS has been selected instead of ECS. Press "DBS" button until display reads "ECS" then press MEMO button. Do this for every affected channel. (With DBS selected, frequency steps are ~ 4MHz. For ECS, frequency goes in 1MHz steps). Check switch setting on rear panel. Left position is 0 volt. Centre is 18 volts. Right is 15v for ECS and 18v for DBS. Check Voltages from transformer secondary on J401. Check fuses F401 and F402. Check bridge rectifier behind F401. Ensure voltage is reaching IC115 with 12 volts coming out. (IC115 is in the centre of the panel, adjacent to the right of the mains transformer. Check voltages on Q112, Q145 and IC116 (near the rear panel switch). Microprocessor IC113 may have died (unavailable). Check C108, C109, C111 and IC102. Dry joints on Scart socket, R.F. modulator or relays. Dry joints on power supply connector. Intermittent shorted turns on mains transformer primary. An internal modification is possible to allow the decoder to work (see photograph). The resistor can be 1k to 10k in value. Cut the track each side of the capacitor connection, as indicated by arrows. The TV must be connected to the RF output socket because the decoded picture is not routed via the TV SCART. Connect the decoder to the VCR Scart socket. 1. Undo the four black cross-head screws and remove the top cover. 2. Undo the four chrome cross-head screws and remove the bottom plate. 3. Locate IC127 which has a spare section that we will use. 4. Use the picture to identify the track to be cut. Cut the track on each side of the 100uF capacitor. 5. 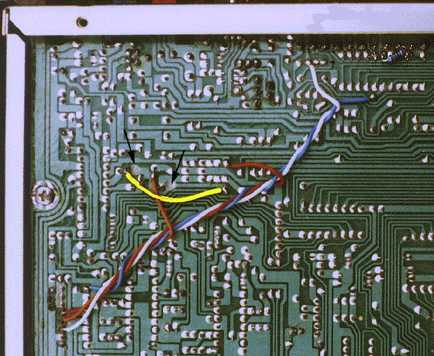 Join the two cut ends of the track, leaving the 100uF capacitor unconnected. 6. Solder a wire from the free "+" end of the 100uF capacitor to pin 4 of IC127. 7. Solder a wire from pin 5 of IC127 to the position marked "Q135". 8. Solder a wire from pin 3 of IC127 to pin 20 of Scart 2 (J114). 9. Solder a wire from pin 9 of IC127 to the position shown in the picture. 10. Solder a 10k resistor between pins 8 and 5 of Scart 2 (J114). 11. Check all connections for position and soldering quality. 12. Replace base plate and cover. 13. Connect receiver and switch on. 14. Tune in a Videocrypt encoded channel. 15. Connect a Videocrypt decoder to Scart 2 (J114). 16. The unit should automatically feed the signal through the decoder. 17. If a picture is not present then IC127 (4053) may be damaged. If the UST-92 D2MAC transcoder is connected, the TV must be connected to the UST-92 TV SCART socket (or RF socket on later models) because the D2MAC picture is not routed to the receiver TV SCART or to the RF output. You must select [MAC] on the receiver front panel button. Q801 tends to overheat. Sometimes it goes short circuit and sometimes it melts the solder and falls out. I always replace it with a BD936 or TIP32A on the upper (track) side of the PCB as shown in the sketch. Fit double-sided foam adhesive tape beneath transistor. Replace one of the two large resistors (100 ) with 47 0.5W (R828 or R834). You can check the polariser current by fitting a 68 2 Watt resistor to the polariser terminals on the rear panel. Adjusting the skew to maximum should give a reading of at least 8 volts across the resistor. Replace fuse F401 (T1A) with T2A fuse. If still no LNB voltage, check inside the tuner; the track breaks where the "F" connector is soldered. If T2A fuse melts the mains transformer may have an intermittent fault. Disconnect the power supply from the main board. Locate pin 7 of IC804 on polariser board. Solder a wire to it and feed the wire through the main board to the underside. Remove the 7815 regulator (the front one of three on the aluminium divider wall) and refit it with an insulating kit. Do not resolder the centre leg. Fit transistor, 3v9 zener and resistors as shown. Connect the wire to the 3k3 resistor. Connect power supply. Select +++ for 14v and - - - for 18v. Check D405 (27 volt zener). Replace 10 F capacitor inside the tuner (front right side). Test this by warming the capacitor with a soldering iron. Remove and discard the large capacitor which is close to the fuse. If the fuse still blows, renew the transformer. Connect decoder to the right hand SCART socket as viewed from front. Open flap and press [AUX] until you see [A1] indicated. Press [MEMO]. Repeat for each scrambled channel. Most faults are caused by incorrect installation. Replace Q109 even if it measures correctly. Check Q110, Q105 and Q106 for short circuit. Check cut-out which goes open circuit. Check D120, D121, D119 which go short circuit. Check Opto couplers IC108 and IC109 which go open circuit. Measure battery cell on the main board. When new this is 3.2 volts. Causes problem if less than 2.8 volts. Replace if less than 3 volts. Cut tags of existing cell, leaving them as long as possible. Solder tags of new battery to tags still in board. Saves the trouble of taking out the board and also allows the largest size of cell to be fitted for longer life. Battery available from SatCure. On early versions, remove the wire link between R164 and pin 33 (end pin) of the microprocessor. On later versions, cut the track which forms the same connection. The UST-92 is designed to work with Uniden receivers. Although it may work satisfactorily with other makes of receiver, consistent operation can not be guaranteed. In particular, it will not work correctly unless the receiver has the correct MAC de-emphasised baseband output available. The UST-92 will usually not work with Pace or Monterey receivers. Note: Later UST-92 decoders include Eurocrypt. Of the earlier types, only those of "series 7" can be modified to incorporate Eurocrypt. Note: Eprom versions prior to v5.03 may not support Filmnet encryption reliably. (The Eprom must be a fast access, 120nS, type 27C512). Disconnect the mains supply and remove the cover. Remove the "jumper" link located in front of the 8 pin I.C. at the front of the unit. Replace the existing EPROM with the new (version 5.03 or later). Use s and t to minimise the scrolling of the picture. Replace the "jumper" link and press [SELECT]. If the decoder is genuinely faulty (i.e. it used to work with the same receiver and the receiver tuner is O.K. ), replace I.C. marked DMA2286.